PokerStars is by far the largest online poker room today. PokerStars software offers action in every game and nearly any limit at virtually any time of the day no matter where you live. PokerStars is home to some of the largest tournaments online, including the famous weekly Sunday Million. There are also numerous smaller buy-in tournaments all day long in pretty much every format imaginable. Other tournament options include satellites to all of the major tournaments as well as live tournaments like the World Series of Poker, World Poker Tour, and the North American Poker Tour. The software that PokerStars offers allows for a superb user experience. The initial sign-up bonus at PokerStars is 100% up to $600 and the site offers a number of reload bonuses each year. Their bonuses are relatively easy to clear and the points that you earn while clearing them can be redeemed in the Frequent Player Point (FPP) store. There, you'll find books, PokerStars gear, and other items like electronics. In addition, a variety of tournaments allow FPPs to be used for entry. PokerStars offers some of the best customer service in the industry. While only available through e-mail, the customer service agents at PokerStars are extremely knowledgeable and will go to great lengths to make sure your question is answered in a satisfactory manner. 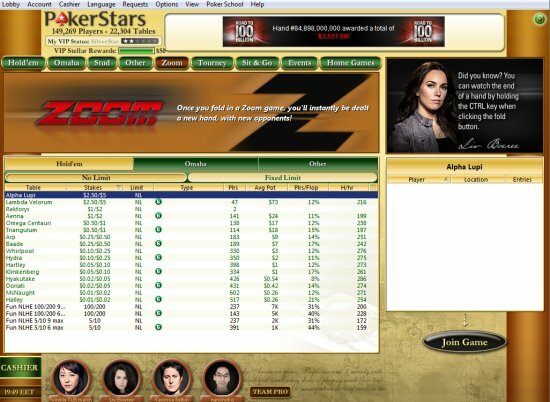 Being the largest poker site by a significant margin, PokerStars is usually the first to be supported by new pieces of third-party poker software. This means that if you’re playing at PokerStars, you’ll always be able to use the latest versions of PokerTracker, Holdem Manager, and whatever other poker software you like. Having access to all of these extra tools can improve your play as well as your win rate. PokerStars has what most people consider to be the best software in the industry. It offers all of the options you could want to customize your playing experience to perfection. If you are unhappy with the appearance of the software, you can choose from a wide variety of user-created custom themes. From changing the look of the table to the style of the cards, anything is possible. The lobby is extremely well-organized and has a robust filtering system that allows you to find exactly the game that you want with minimal effort. Tables are resizable and easily managed, making the PokerStars software ideal for people who enjoy playing a bunch of tables. The maximum number of tables that you can play at a time is 24, which should be about as many as one person can handle. You can choose from nine-person, six-person, or heads-up tables with a multitude of options such as turbo, deep stack, and no disconnect protect. PokerStars' software features almost every variety of game with traffic around-the-clock. For many players, tournaments are the most appealing part of the online game and PokerStars’ MTT schedule is second-to-none. Everyone is familiar with the famous Sunday Million, which has a guaranteed prize pool of $1,000,000 every single weekend. Also on Sundays, PokerStars runs the $215 Sunday Warm-Up, $215 Sunday Second Chance, $535 Sunday 500, and $11 Sunday Storm. PokerStars offers many guaranteed tournaments, including its famous "Big" and "Hot" tournamments, with buy-ins ranging from $0.55 to $162. You can find a tournament to suit your bankroll any time of the day. PokerStars offers Home Games, which is a unique feature that no other major site offers. You can invite your friends into your very own poker club and set up your own tournaments with leaderboards as well as cash games. PokerStars also offers Zoom Poker, a fast-moving ring game where you opponents change after every hand you fold. For No Limit Hold'em, the stakes range from $0.01/$0.02 to $2.50/$5.00. For Pot Limit Omaha, the stakes range from $0.01/$0.02 to $1/$2. There are also smaller stakes Zoom Limit Hold'em, Five Card Draw, and Pot Limit Omaha High/Low games. Pokerstars also has a Mobile application available for convenient play whereever you are. In terms of safety and security, PokerStars is licensed by the Kahnawake Gaming Commission. The site is audited by two separate organizations, Citigal, Inc. and BMM International, and has never experienced negative publicity with regards to finances. Como faço para aparecer meu bankrool na tela de grafico ou na tela principal?